In this super easy special fx makeup tutorial you learn how to create realistic looking scrape wounds. An effect that can be combined with others for a complete look. Go check his creations out! Nikon D810, Nikon 105mm f/2.8 Micro Ais, Final Cut Pro X, Apple Macbook Pro 15″ Retina. Hey can you recommend any brands you use for the brushes or any specific type/size you use? what if we don't have latex, what could we use? Can you guys do a tutorial on some supernatural (the show) inspired stuff? I have a suggestion. First, apply latex and when it's still wet, take a mascara wand and run it the way the scrape is going and get some pebbles and dirt and stick it on. When it dries, add red color, a little of blue and yellow and a tiny bit of blood. Can you make one of these for scratches? can you do some tutorials that are just with house hold items like lipsticks and toilet paper and eye shadows? A lot of us don't have latex. Sometimes you can replace latex with Elmer's glue and the face paints with matte eyeshadows/lipsticks. I want to use this for my Han Solo halloween costume just to give it a little more pizzaz (or whatever). Is the stuff being used grease paint? Like for the red and brown? Var hittar ni alla produkter!! Bor i Malmö och Halloween närmar sig. Finns det nån bra affär?? +Emily Quinn Hashtag you work with #Ellimacs and we'll take a look! I love all of these videos so much. 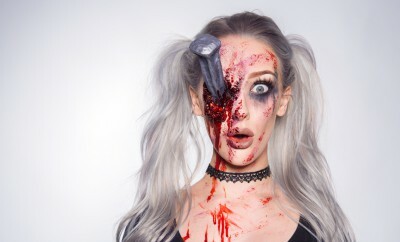 I always do a scary look for Halloween and this year I'm going for a blood-gore look! This channel is definitely inspiring me, thank you so much! So talented! +RukiaFujioka Noted :) What would you have wanted to get a better look at? closer angles? whens the shout out video coming out? Hey! I found this channel today and i love it! A question; What should i be for Halloween? How do u pick the people your giving shout outs too?? Do we have to send u a message or.....??? Will you be doing a tutorial on the split lip? +ellimacs sfx makeup ooo Yay thank you! I know this will sound really dumb, but when you say start with red color, do you mean like eye shadow or something similar? If so what shades would you recommend?